Lines of communication create community – For the fainthearted . . .
← Unchanged in twenty centuries? 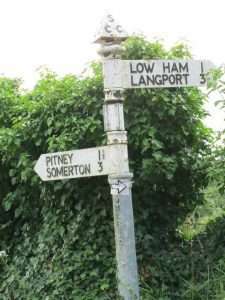 The fingerpost in the village of Shapwick announced that High Ham was four and a half miles. 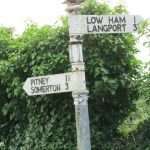 It seemed such an unlikely claim that I measured the distance from the sign in Shapwick to the village green in High Ham on the car odometer – it was correct. 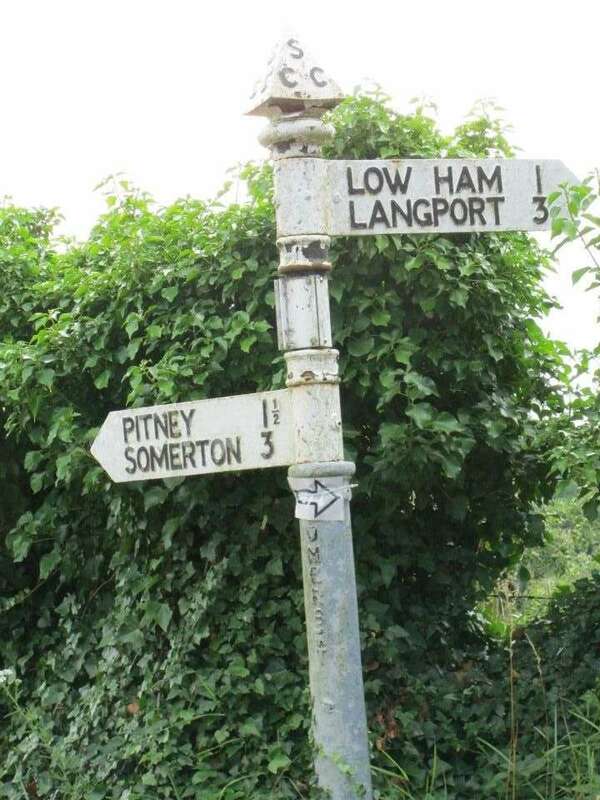 Perhaps the doubt was unwarranted, the wrought iron fingerposts were erected in times when local councils were particular about things being correct; in some places distances are shown to the nearest quarter of a mile. The thought arose because there seemed no connection between the villages, no reason for the distance to High Ham to be shown; lines of communication between the one place and another consisted of a narrow road down a hill and an undulating road across a peat moor. There might be reason for people to travel through High Ham on their way from Shapwick to somewhere else; there seemed little reason for anyone to travel to High Ham. The two villages lie in the jurisdiction of different district councils; they are within different parliamentary constituencies; their children attend different secondary schools; the two parishes are not even contiguous, the parish of Ashcott lying as a buffer between them. One could set out across the moor toward High Ham and not be certain of ever arriving anywhere. If one were to ask the inhabitants of the respective villages whether they belonged to the same community, the answer would probably be a firm negative. There might only be four and a half miles distance, but there is little sense of connection. Lines of communication and bonds of community seem inextricably bound together, the more communication exists, the greater the shared sense of community. Four and a half miles may be a close geographical proximity, but in the case of the two villages geography is not a factor that has the capacity to create a community. At a time when the government is concerned about loneliness to the extent that it last week appointed a minister to address issues affecting nine million people, it is worthwhile noting that it is communication that creates community. Initiatives will not be successful unless the connections the government seeks to create are consonant with people’s own perceptions of which communities it is with which they identify, with which communities they feel they can communicate. Programmes not rooted in people’s own feelings of where they belong will no more bind them into communities than road signs saying the distance is only four and a half miles will bind together two disparate villages.